Kursk-born Sviridov has been a peripheral figure for most even moderately well informed listeners and collectors. His Oratorio Pathetique and Song of the Forests have been on LP and CD but that is about it. 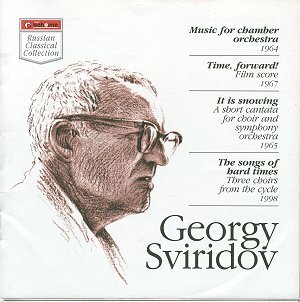 This disc is the first complete Sviridov collection I have stumbled across. It is taken from a live all-Sviridov concert in Moscow. Coughs and shuffling are to be heard without being much of a distraction. The Music for Chamber Orchestra is bright and imaginative and if the thinnish strings do few favours this is clearly a diverting inspiration. The prominent role for the piano suggests a piano concerto. The medium for communication seems to bring together such diverse voices as Shostakovich (with whom he studied) and in the first and last of the three movements, Gerald Finzi (the massed string writing in the clarinet concerto) and later Arthur Bliss (Music for Strings). The notes tell us nothing about the film Time Forward! The six movement suite: a raw slow brass fanfare (Copland open-air style), a chattering Prokofiev ditty and foxtrot with braying trombone and swooping flute solo, a minatory march underpinned by a hollow drumbeat, a nocturne incorporating a ppp elegiac trumpet figure of understated power and a raucous, ironmongery finale alive with the clamour of Schedrin's Carmen ballet. Boris Pasternak's three poems are deliciously set by Sviridov in It is Snowing. The songbird-hearted flute lifts the mesmerising first poem with its slowly descending flakes. The much longer Soul moves just as slowly as the first song and its slow tolling is most affecting. A pity that the words are not printed in English in the booklet. Night is as forward and optimistic as a Rutter song. The three short Blok songs (and for that matter the Pasternak settings) are indicators of Sviridov's pursuit of the finest verse in the Russian language. This triptych is an a cappella work unlike the other three items here. They are most beautifully sung with successful attention to dynamics and tuning. Make it a point to hear more Sviridov. He here proves that he is not a dissonance-man but one much more at peace with the affecting emotional language of the lyrical singers in Russia's artistic history. All credit to Andrey Feofanov and all at Boheme for their courage in recording this repertoire.